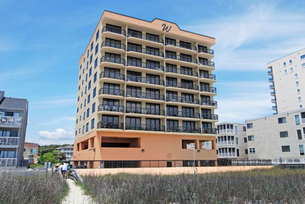 Families are invited to spend their North Myrtle Beach vacation on the oceanfront at Wellington in North Myrtle Beach, South Carolina. The Atlantic Ocean is only steps away from your three-bedroom, two-bath oceanfront North Myrtle Beach condominium and popular Myrtle Beach attractions are only minutes from this oceanfront North Myrtle Beach vacation property. Bask in the peace and tranquility of this oceanfront North Myrtle Beach resort and the sunny, comfortable oceanfront North Myrtle Beach rental that it affords. Located in a beautiful neighborhood of North Myrtle Beach, SC, Wellington is part of Crescent Beach, where the beach is family friendly. It is as easy as pie to carry your beach towel and sunglasses down to where the ocean water meets the sandy shoreline. Pick a spot along this section of beachfront that enjoys fewer crowds and more locals. Looking out at the vast sea while your three-bedroom North Myrtle Beach vacation condo is right behind you is heavenly. This North Myrtle Beach condominium rental is equipped with all the modern conveniences of home, including a full kitchen with full size refrigerator, stove, microwave and dishwasher. The washer and dryer in your North Myrtle Beach vacation condo will come in handy when laundry needs to be washed. And the grill is ready for you to cook some South Carolina shrimp. There is even a sparkling blue swimming pool that is oceanfront so from the waterfront sun deck you can hear laughter down on the beach, a soothing sound that relaxes the tensest of muscles. Lucky you, North Myrtle Beach, SC amusements and attractions are so close to Wellington that you will never have to drive far to reach your favorite destinations. Shopping, dining, championship golf—they are all really close to these North Myrtle Beach vacation condominiums. While Myrtle Beach, South Carolina may be known for its 100 golf courses and 60 miles of white, sandy beaches, this fun-in-the-sun destination also has numerous live theatre venues where evening performances and weekend matinees are suitable for all ages. Make your reservations now for this North Myrtle Beach resort so you can look forward to all that North Myrtle Beach, South Carolina has in store for your family. Elliott Beach Rentals is not affiliated with onsite management or the HOA of Wellington.